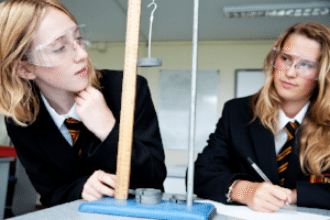 The AQA Trilogy Science course introduces students to fundamental ideas in scientific theory and helps them learn practical skills through topical investigations. Science is a set of ideas about the material world. The Course includes all the parts of what good science is at GCSE level: whether it be investigating, observing, experimenting or testing out ideas and thinking about them. The way scientific ideas flow through the specification will help to develop a deeper understanding of science. This will involve talking about, reading and writing about science plus the actual doing, as well as representing science in its many forms both mathematically and visually through models. This specification encourages the development of knowledge and understanding in science through opportunities for working scientifically. The specification covers Biology, Chemistry and Physics. This is a two year course with all the examinations at the end of year 11. Students will sit six examinations, two in Biology, two in Chemistry and two in Physics. Each examination is one hour and fifteen minutes in length and worth 16.7% of the final grade. Students can be entered at either Foundation or Higher tier.